I read this book when it first came out, and then I decided to wait until the trilogy was complete before rereading it. I remembered certain parts of it because Paolini is a very vivid writer (as are most good authors, I suppose) and the people and locations in the novel remained locked away in my mind. I think part of what made this story so fascinating for me is the dragonlore Paolini has invented. 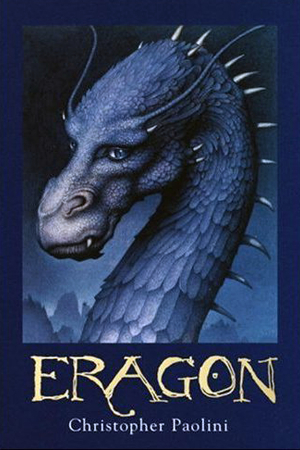 While Twilight is fascinating in Stephanie Meyer’s reworking of the traditional vampire mythology, Eragon is equally fascinating in Paolini’s writing. However, while Twilight very clearly illustrated the amateurish style of Meyer’s developing writing, Eragon is in a different class due to Paolini’s skill. I was surprised at the level of sophistication of this novel given that it was written not only as a first novel, but also by a very young author. Paolini is definitely very talented.That’s quite enough Paolini-praising (and Meyer-bashing). On to the plot…. Well, I was entertained the entire time, and found myself unable to put down the book even when it was 4am and I knew I should be sleeping. Each chapter was so suspenseful that I couldn’t bring myself to stop reading!The characters had surprising depth, and the plot was complex and involved. I really enjoyed this surprising read, and am looking forward to finishing the series.